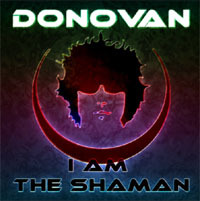 · In April 2010 Donovan released a new single called I Am The Shaman from Ritual Groove, on his own label Donovan Discs. The song was recorded in March, in David Lynch's music studio in Hollywood. Lynch himself produced it. · The lyrics talk about Lorralie, or Lorelei, a mythical goddess that appeared in the Clemens Brentano poem Zu Bacharach am Rheine in 1801. Lorelei is a 120 meters rock on the eastern bank of the Rhine in Germany. Strong currents and dangerous rocks by Lorelei have caused lots of boat accidents over the years. Those currents also create a murmuring sound that Lorelei echoes, as an amplifier (the name Lorelei literally mean "murmur rock" or "murmuring rock"). These sounds inspired tales and poems about an enchanted female who draws the attention of the sailors causing their ruin. · I Am The Shaman represents the myth of Lorelei submerging the listener into an enveloping atmosphere of echoes, distant sounds, background murmurs... all mixed with evocative melodies, semi-autobiographical lyrics, rhithmics guitars, and strong orchestation, leading to a very Lynchian chorus.